Hi again bloggers and welcome to my new followers nic to have you along with me on my crafting Journey and also a great big thanks to all of you who have been following my Alpha Challenge journey and have left lovely comments...Thank you! I started as usual with gesso over my pages that I had stuck together and stamped the image which I then painted Fusion style with Pebeo Acrylic Paint in manderine, mango for the petals and burnt umber was used for the middle and a little mango. I also used a mask for the brickwall and distress inks frayed burlap and vintage photo. I do love the texture this painting style gives to the page I just wish it showed up well in the photo! I also added a little journaling ...A first for me as I'm not comfortable writing my thoughts on my page...........but this challenge is a whole new journey for me as it is the first altered book I have done too. As we can only choose between Ma-Me this means there are quite a few pages left in M unused so I think I may stick them together and decorate so the book when finished will have all the sections decorated......what are you all doing?! Love your Marigolds. The colour is really vibrant on your pages. I have elected to tear my pages out of the dictionary and make a seperate Alpha book which will have approx 14 pages to it counting the front and back covers when finished. Hugs Mrs A.
Ah summer, lovely on a snowy day. 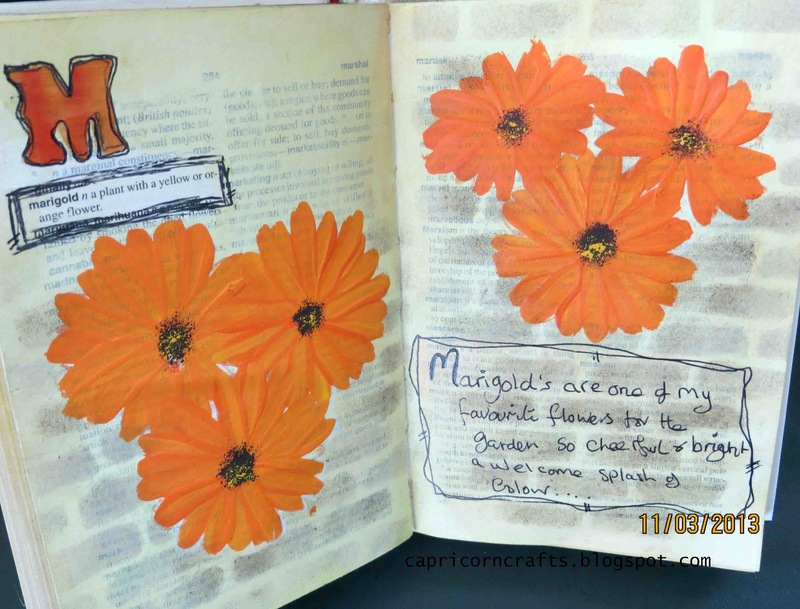 Gorgeous vibrant pages Maggie, your marigolds are superb. Great painting and fab choice of word. I'm thinking of leaving the rest of the dictionary open so you can find the chosen words in each section. However I'm also thinking of doing some more simple stamping here and there where I can. Who knows how this will end up we have many weeks to go still! Love your marigolds - beautifully painted and very bright and cheerful! Your daisies turned marigolds are perfect! Color is wonderful tool isn't it. I like the background you created also. What lovely texture on these gorgeous marigolds. The petals look touchable and show up beautifully on the background. I like that the letter M is is the same bright colour. Good for you for journalling on the page. Never thought of that but I like the idea. Hey Maggie - beautifully done. I sure would like to learn this painting technique. I think this Dictionary challenge from the Craft Barn is soo much fun. Your Marigolds are gorgeous! Fabulous pages with the bright marigolds to cheer us on these dull days, love it. Love your bright and cheerful marigolds. Lovely page. Wow, great marigolds Maggie, we always have them in the summer. Thanks for visiting and commenting on my page. Lovely page! Your Marigolds are so pretty!! Wonderful vibrant flowers Maggie. Gorgeous pages. Fantastic pages in great colors. I agree with you, marigolds are one of my faves too because they are so cheery. Sorry I'm so late in returning the visit!